ESO has signed a large contract to deliver sodium lasers for the new Adaptive Optics Facility for the Very Large Telescope at Paranal. Laser guide stars are used as part of adaptive optics equipment to help telescopes correct for atmospheric effects. This new facility will let astronomers make sharper observations, over more of the sky and in a broader range of conditions than is possible at present. Following a competitive design study, ESO has awarded the contract to build the lasers to Toptica Photonics AG, a German laser manufacturer. The lasers will be based on a novel Raman fibre amplification technology developed by the Laser Systems Department at ESO. This allows the lasers to be lighter, cheaper, more compact and more reliable than would be possible with competing technologies. Laser guide stars work by projecting a powerful laser beam to the upper reaches of the atmosphere. The beam excites the sodium atoms in this atmospheric layer, producing light that shines back down towards the telescope — an artificial star in the sky. Sophisticated computer systems are then able to detect how the atmospheric conditions have affected the light from the laser guide star to make precise and rapid adjustments to the shape of the telescope’s secondary mirror to counteract the atmosphere’s effects. This eliminates the characteristic twinkle of the stars in the night sky, meaning more accurate and more useful observations. 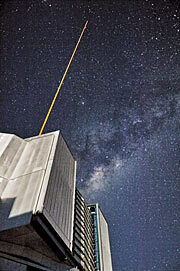 “This cutting edge fibre laser technology developed at ESO will be a pathfinder for the telescopes of the future, including the European Extremely Large Telescope,” he continues. The contract is supported by a grant of €1.05 million from the OPTICON project, which is funded by the European Union’s Seventh Research and Development Framework Programme (FP7).